Are you preparing to have twins? The thought can feel overwhelming at times. Double the stress. So many questions and so many things to consider... So many choices! From pack ‘n plays, cribs, bassinets, to Moses baskets or even a co-sleeper attached to your bed - you may be thinking “which is the best choice for my newborn twins to sleep?”. Providing a safe, convenient and comfortable space for newborns to sleep in the first few months is essential. 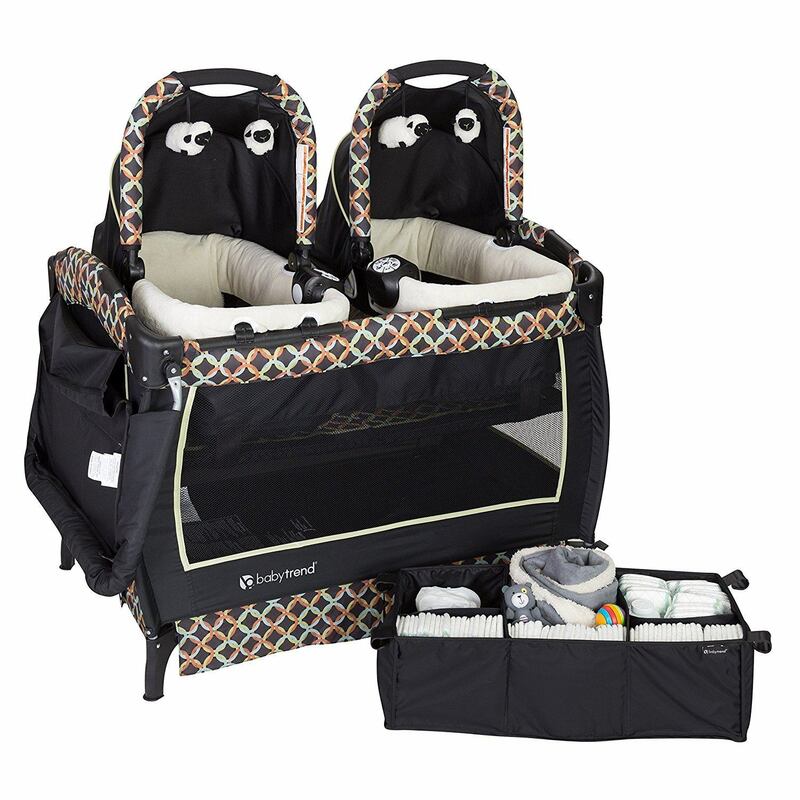 Twin bassinets are a cozy and convenient choice. There are several options to choose from and many things to consider before deciding which bassinet is best for your growing family. Here are the Top Bassinet sellers for Twins. Today’s top choice is the Graco Pack ‘n Play Playard with twin bassinet. The Graco bassinet is an excellent value for the price. It is easy to assemble and portable. The Graco Pack n’ Play Playard weighs 29 lbs. It has a maximum length of 35 inches and measures 46 x 35 x 34 inches. The bassinet is designed for babies that weigh less than 15 lbs. and appropriate for the first 3-6 months your newborns’ lives. 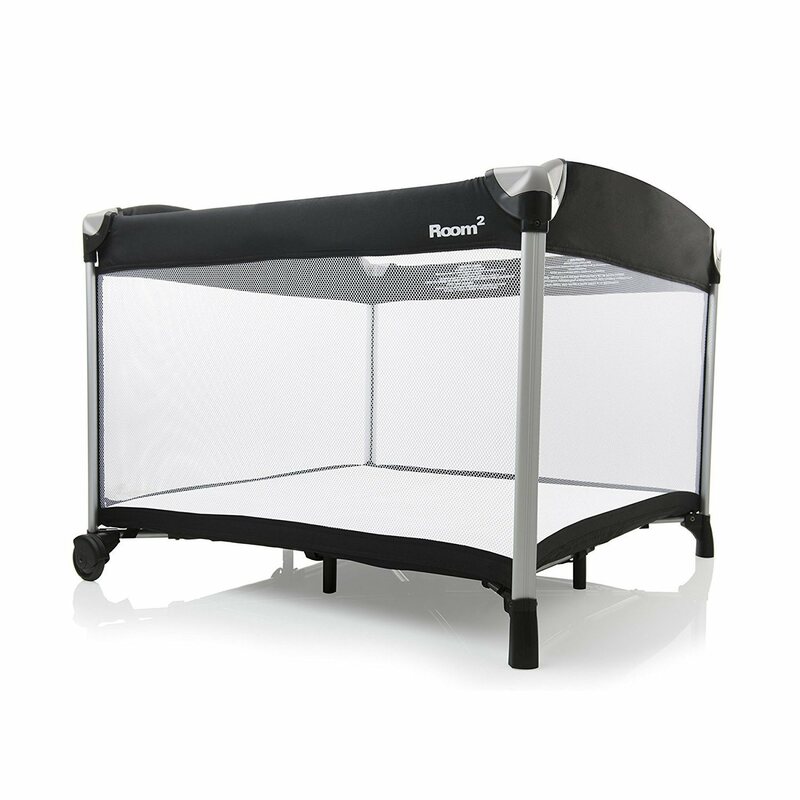 The Playard is made with mesh sides for ventilation. In the bassinet, the babies sleep side by side on one quilted mattress with two separate canopies for each sleeping area. The bassinet is easy to clean by using a damp cloth or sponge with household soap or detergent and wipe clean the vinyl, plastic and metal parts. If you are looking for portability, the bassinet weight totaling 29 lbs. might be a bit heavy for continuous movement, although it does have a set of wheels for mobility. The bassinet also comes with a carrying bag for easy transport. An added functionality of this bassinet is that it also becomes a toddler playard once the twins outgrow the bassinets. Since the bassinets are not stand alone, one user stated an issue where the middle support might droop. This may be a concern to parents. Some parents have also mentioned they prefer the canopies were not connected, but this double bassinet is an attractive choice for the price. The Graco Pack ‘n Play Playard with twin bassinet is our winner. It stands out for its convenience and value it offers for twins. The Baby Trend Twin Nursery Center design lets twins sleep spaciously side-by-side in a full-sized mattress. Each bassinet has its own canopy that can be transformed into a standalone rocker. The pieces are lightweight and include a carry handle for easy transport which is movable. It has plush fabric with mesh sides for ventilation. Baby Trend Twin Nursery Center weighs about 41 lbs. The product measures 49.2 x 46 x 30.3 inches. One of the best features of this twin nursery center is that the bassinets are each removable, not dependent on one another. The Nursery Center comes with a volume controlled sound machine that features songs, calming nature sounds, and vibration. Circle Tech also included a small light feature that is useful for checking on the twins without turning on large room lights. The nursery center also has a storage area for diapers and wipes and a flip away changing table. The bassinet has a one-hand locking mechanism as well as large wheels with brakes for moving. Included a travel/storage tote bag too. Some disadvantages are that the changing table cannot be used if the left bassinet is in the nursery center. The bassinet is only “hand-washable.” At 41 lbs., it is portable but may be too heavy to be moving around often. Some parents mentioned that their twins outgrew the bassinet quickly. The bassinet by Circle Tech is a more expensive option, but the perks may be worth the price for you. Halo is a distinguished brand that has tons of buzz. The Premiere Series of Twin Sleeper Double bassinet was specially designed as the perfect sleep solution for your family. The beautiful space saving bassinet is made of mesh sides that provides your twins the togetherness they crave while giving them separate sleeping areas. The sleeping area is spacious at approximately 35 x 35 inches on two waterproof mattress pads with two fitted sheets. The Halo is the only manufacturer that provides a smooth 360 degrees of rotation bassinet with adjustable height options to offer a special closeness for you and your babies. The mesh side walls also provide the convenience of easy viewing and the ability to lower with minimum pressure making it easier for soothing and feedings throughout the night. The Twin Sleeper Double bassinet also features a nightlight and music module with three lullabies, three nature sounds and two levels of vibration along with two storage pockets for baby essentials. The manufacturer recommends the use of this bassinet up to five months of age or weight capacity of 20 pounds each. Some have reviewed the Halo Bassinest Twin Double Bassinet and have said it is a Must-have. But others have mentioned that they were unhappy with the music/vibrating module having battery life issues. It has also been stated that the bassinet is a bit heavy, weighing a total of 55 pounds when fully assembled. Nonetheless, the Halo Bassinest Twin Sleeper Double Bassinet is an excellent option for its mesh sides, 360-degree rotation, height changeability and its many other features for your twins. It may be on the high end of the price of twin bassinets on the market but an excellent option to consider for your babies. A brand-new popular twin bassinet on the market is made by Baby Trend. 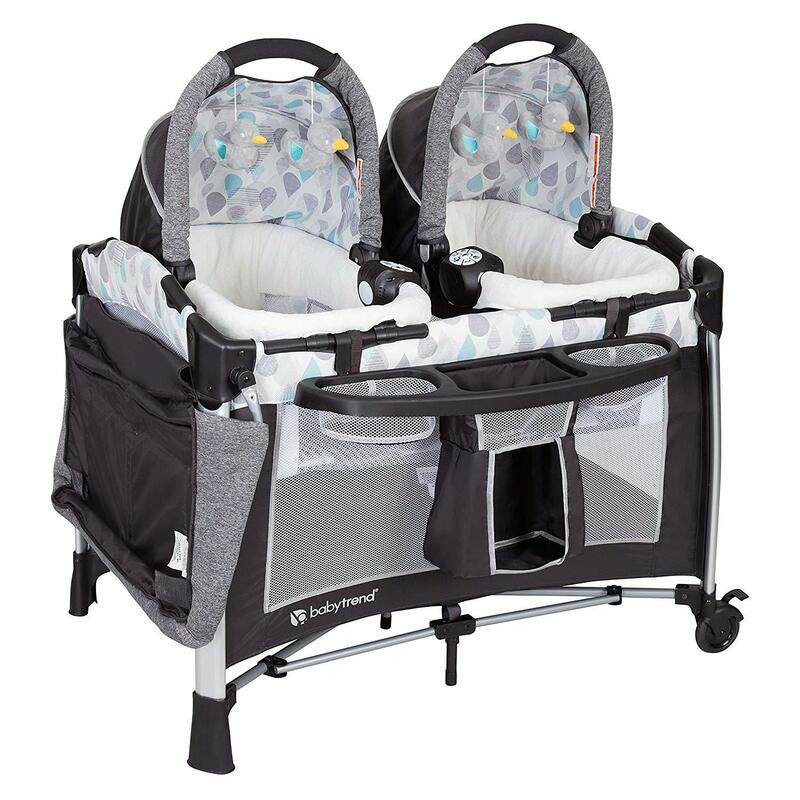 The Baby Trend Go Lite Twins Nursery Center is the perfect solution for parents with twins, weighing in at 38.2 pounds and measuring 46 x 30.3 x 49.2 inches. This model is similar to the Baby Trend Nursery Center but almost three pounds lighter in weight. It encompasses all your babies’ needs and more with easy assembly. The Nursery Center features two rock-a-bye baby bassinets which sit side by side which includes two toys. The cozy bassinets also have individual canopies and easy to carry handles. The lush fabrics can be easily cleaned with warm water and mild household soup. 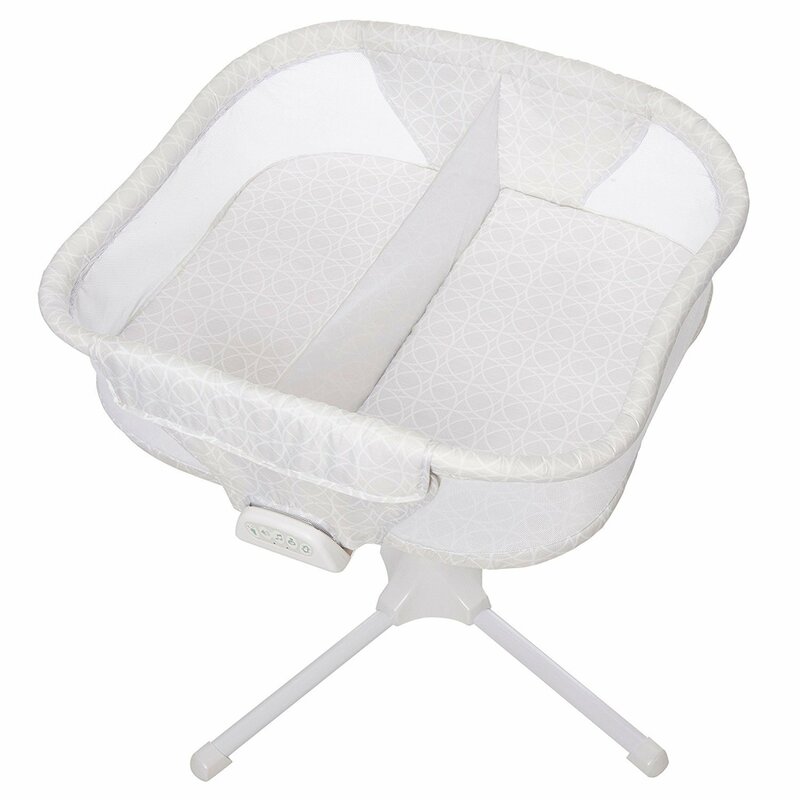 The bassinet is made of mesh sides creates the ideal ventilation and visibility of your babies. The suggested guideline use of the bassinets is from birth to three months, weight up to twelve pounds or height up to twenty-two inches – whichever comes first. Baby Trend thoughtfully designed a fully functional and removable bassinet, with flip away changing table and family organizer. The flip-away changing table is convenient for diaper changing up until your babies are four months old. 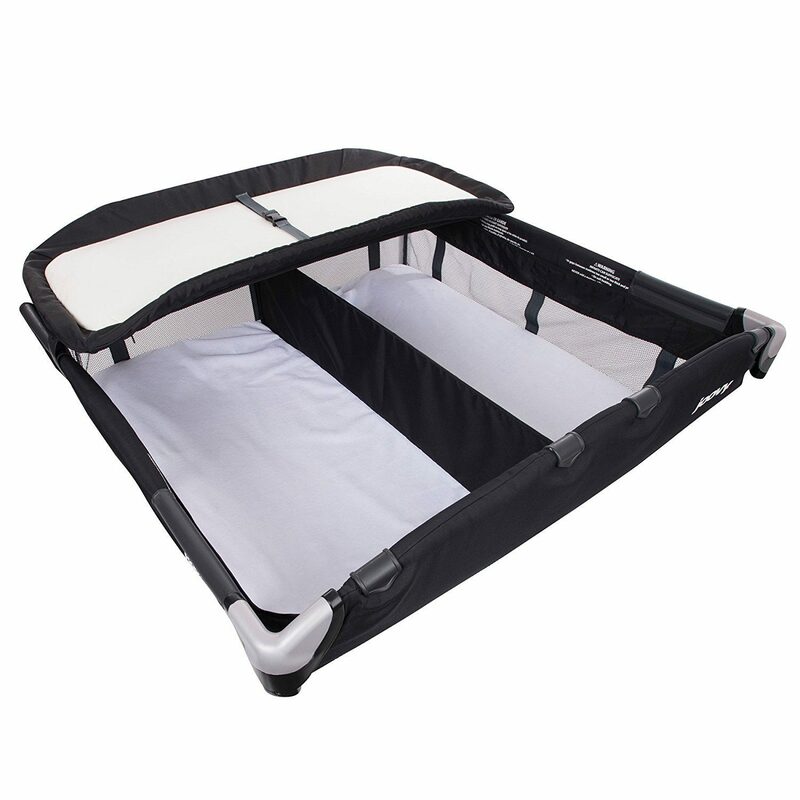 The playard is made of solid aluminum with one-hand locking mechanism. The bassinet base includes large wheels with secured brakes which makes mobility easy on parents. It can also convert into a stand-alone rocker. The company suggests the use of the playard from birth to thirty months of age or thirty-five inches in height max. Additional bonus features included are the electronic music center which has volume control, vibration and a nightlight. The music center has two styles of music and nature sounds that are helpful when trying to soothe your babies. A travel storage tote bag makes it convenient when you need to pack up the bassinet and move locations. We think the nursery center is the perfect collaboration of bassinet, changing table, and playard in one. The JOOVY Room2 Twin Nursery Center has a unique design. The two bassinets are separated with a divider that zips into place for two separate sleeping areas and can be used if one baby is on the top changing table while the other baby can be in the bottom of the system. The water-resistant surface of the twin nursery center is removable, and the cover is machine washable which is an important thing to consider. The changing table holds up to 25 lbs. The changing table also folds down and out of the way when desired. The accessory weighs 9.5 lbs. Which does not include the playard and measures 16 x 5 x 40 inches. It holds a combined weight of 30 lbs and has a removable center that attaches to the playard with plastic clips. Many parents have raved about the Joovy Room2 for its comfort and thick, durable padding. Also, the large size is often a plus. The most important thing about this system is that the system comes as an accessory to the Joovy Room 2 Playard, sold separately. The bassinet slips into the Joovey Room 2 Playard and transforms into a sleeping area or changing table. An excellent bassinet option for your twins. The Joovy Room2 also doubles as a playard if you have space. 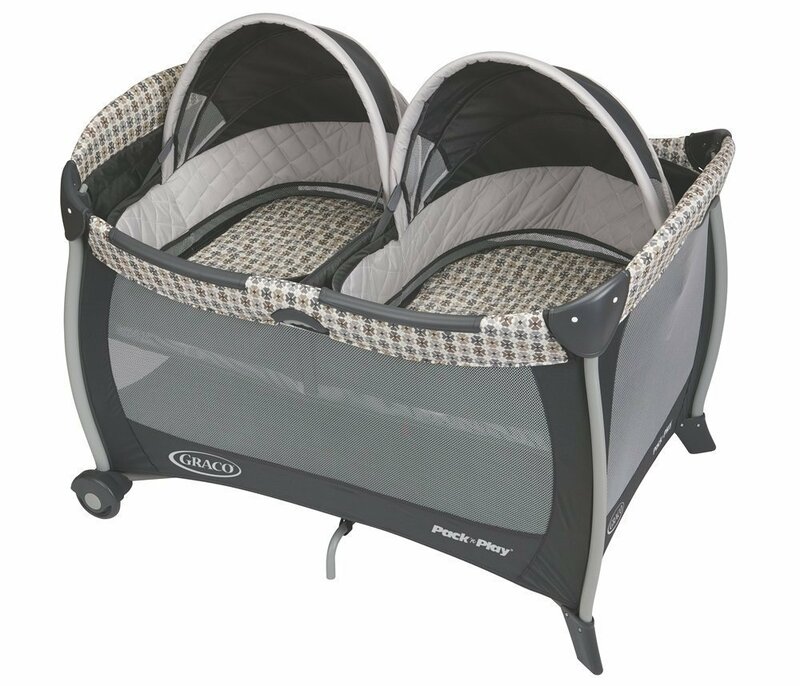 We strongly recommend you consider the Graco Pack 'n Play Playard with Twins Bassinet for your twins. It is a fantastic bassinet that is sure to be a hit for your two babies. Many parents who own this bassinet state it has excellent functionality. This must-have bassinet can be used as a bassinet and playard in one. The canopy and casters on the bassinet make mobility accessible, and the carrying bag included also come in handy. There are so many options to consider when you are looking for a bassinet for your two babies. We think the best value is for the more budget-friendly option. Each twin bassinet mentioned above are all fantastic options on market today. Just try to narrow down what is most important to you- whether its functionality, mobility, price affordability or maybe longevity of the bassinet. Happy Twin Shopping!